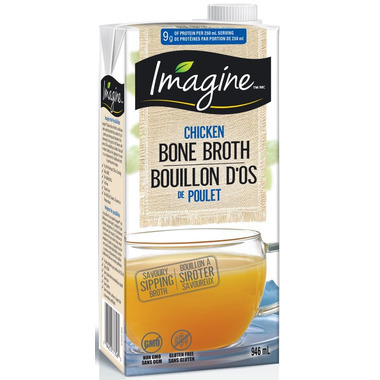 Imagine Foods Chicken Bone Broth is a delicious sipping broth to give you a nutritious boost to your day with a good source of protein. They added just a dash of sea salt to bring out its rich flavour. They love to sip it with a little ground pepper and some crushed garlic. Ingredients: Chicken Stock, Organic Chicken Flavor (Contains Organic Chicken), Sea Salt. Great for when you run out of homemade bone broth.